Though developers have had access to the WatchKit API for the upcoming Apple Watch since the debut of iOS 8.2 in November, we've still learned very little about what apps will be able to do and what kind of apps we can expect to see when the device launches. We know that common Apple apps like Messages, Mail, and others will be available on the Apple Watch based on what Apple shared in the keynote and on its dedicated Apple Watch website, but third-party developers have not divulged much about their plans for the device, though hundreds of innovative apps and experiences are undoubtedly in the works. One major game developer, NimbleBit, is working on a new game that will be playable on the Apple Watch. Shared by our sister site TouchArcade, Letterpad is a simple word game that will be available on both iOS and the Apple Watch. The object of the game is to make words related to a specified topic from a grid of nine letters, and a mockup of what the game might look like is below. Games may not seem conducive to the Apple Watch given its rumored limited battery life (the device will need to be charged on a daily basis) and its small screen, but simple games like Letterpad will translate well to the device. As we've learned from the WatchKit API, the first apps coming out for the Apple Watch will be entirely reliant on the iPhone, powered by the phone itself and projected to the Apple Watch to conserve battery. 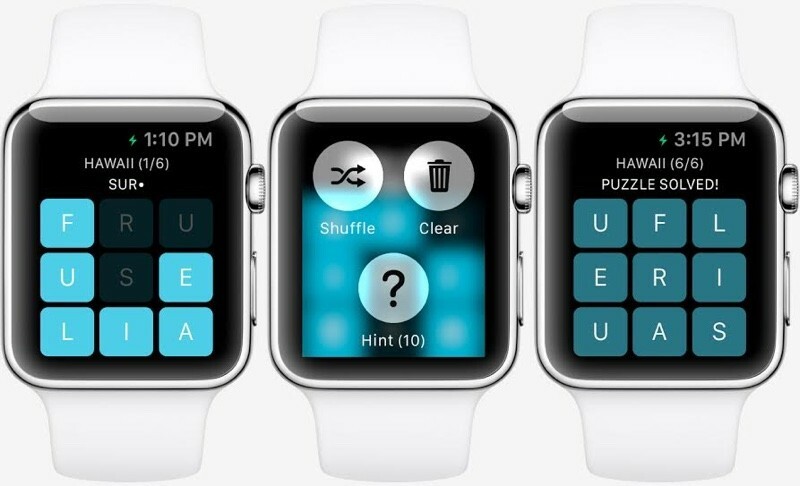 This is just a first glimpse of one simple game that will be playable on the wrist thanks to the Apple Watch, and developers likely have a range of unique game experiences in mind. The Apple Watch's Taptic Engine and Force Touch capabilities, to determine between taps and presses and deliver subtle alerts, may enable all new types of games and apps that we haven't even considered yet, and over the course of the next few months, we'll likely get a much clearer picture of what developers are planning to create for the device. The most recent rumors have suggested that the Apple Watch could see a March debut, and while pricing remains largely unknown, we do know that the entry-level Apple Watch will be priced at $349. or i can take out my phone for a bigger screen to play on. i don't think i should be in any particular app for longer than a minute on the apple watch. I cannot imagine the hilarity of seeing someone furiously tapping a game on his watch. Games on a watch? I'm not sure of their rationale. Do they really expect people to play games on their watch and kill it's less-than-a-day-long battery life? Games on a phone? I'm not sure of their rationale. Do they really expect people to play games on their phone and kill it's less-than-a-day-long battery life when we have game consoles that are far more powerful and don't have battery issues? A game on a 3" watch ? Apple HIG says watch interactions should be brief. I wonder what their stance on games will be. Playing a game on the watch isn't a brief interaction. Games on a watch? Well I've never been so threatened by the idea of things being different than what I'm used to! What's next? Humans in flying machines? Or mechanical vehicles which replace the horse? Just nonsense. All of it. Way to go apple .